Last week I went on and on about how I was making this cheesecake for my Russian blog and it did not work out because I used a wrong size pan. And although it is true that the poor cake tried to rise above the sides of the pan and ultimately failed, and fell, in the end it actually worked out not too bad. I cut off the warped top and decorated it with strawberries. You know, they say that chefs hide their mistakes under sauces, and pastry chefs - under the icing :). This is exactly the case here: the strawberry sauce is normally served on the side for New York cheesecake but I had it on top. When I first came to the States, I had never heard of cream cheese or cheesecake. At the first taste, I was hooked. I ordered cheesecake in every restaurant and cafe that served it, as though it were the greatest invention of humanity. It's amazing that I did not balloon into the size of New York. 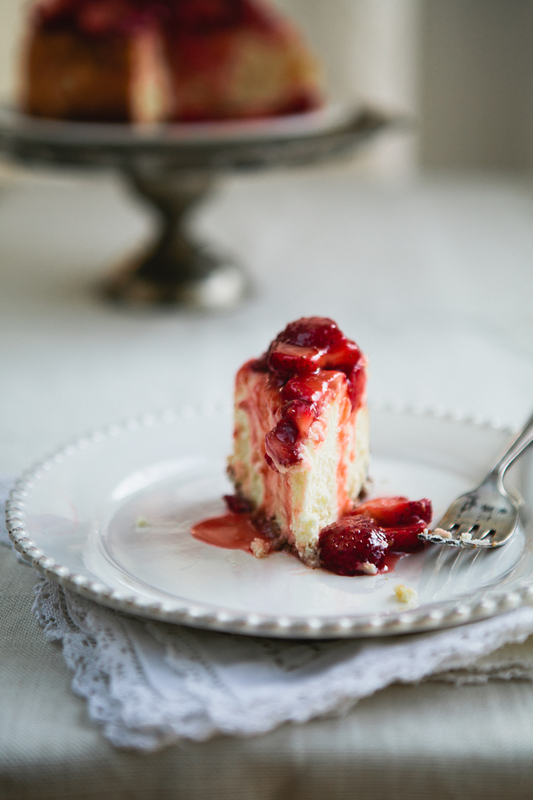 By the way, I do remain a fan of the New York style cheesecake: of its tall stature, of its dense creaminess without the jellied texture of some other cheesecakes in which gelatine is used, and of its moderate sweetness, offset by a fruit sauce. The following recipe is based on the one developed in America's Test Kitchen. It is perfect. Preheat oven to 325F (160C). Grease a 9 in (23 cm) springform pan. Mix crust ingredients and press the mixture to bottom and sides of the pan, about 1/2 in (1 cm) high. Bake until browned and fragrant, about 13 min. Cool completely. Turn up heat to 500F (260C). Using electric mixer, mix cream cheese on medium speed until creamy, 1 min. Add salt and half the sugar and mix 1 more minute. Add the rest of sugar and mix 1 more minute. Add sour cream, lemon juice and vanilla, mix at low speed 1 minute. Add yolks and mix at medium speed 1 minute, until well incorporated. Add eggs 2 at a time, mixing well after each addition. Scrape the sides of the bowl frequently. Place cooled pan on baking sheet (in case of spills), pour cream cheese filling into pan, bake 10 minutes. DECREASE TEMPERATURE to 200F (90C) (do not open oven door) and bake about 1 1/2 hrs. If you have an instant read thermometer, great: the temperature in the center of the cake should read 150F (66C). Cool completely, about 2.5 - 3 hrs, then refrigerate for at least 3 hrs (cheesecake can keep up to 4 days, refrigerated). Run a knife around the sides of pan to separate cheesecake, remove sides. Let sit 30 min at room temperature before cutting. Mix strawberries with sugar, let sit a few minutes, drain. Heat jam in small pan, cook, stirring frequently, until thick and no longer foamy, about 3 min. Mix in strawberries and lemon juice. Serve. ***In case you're wondering, half the recipe calls for a 7 in pan :). Congrats for such a great job! I just posted you in my Favourites List so i'll be visiting regularly!!! Muacss! You are so sweet. I will be sure to check out your blog. Thank you Natasha. Nice blog you have there! It is just beautiful! From Russia to Texas...wow. I am in Texas too...Houston. I had a good friend when we lived in Michigan who immigrated from the Ukraine when she was 14. She is a great friend and I loved hearing her stories. Hi Sarah! I'm in Houston too. I have to say, I love the local weather. Thanks for stopping by... and for taking the time to comment. Mr. Sandman loves cheescakes, I'll think about baking this one. Hummmm! I love this dessert too and I have some diferent recipes in my blog (I have a translate if you want, jaja!) but I NEED to try this one, it looks fantastic!!! A saw that you also had difficulty with making half the recipe :)). Thanks sweetie. 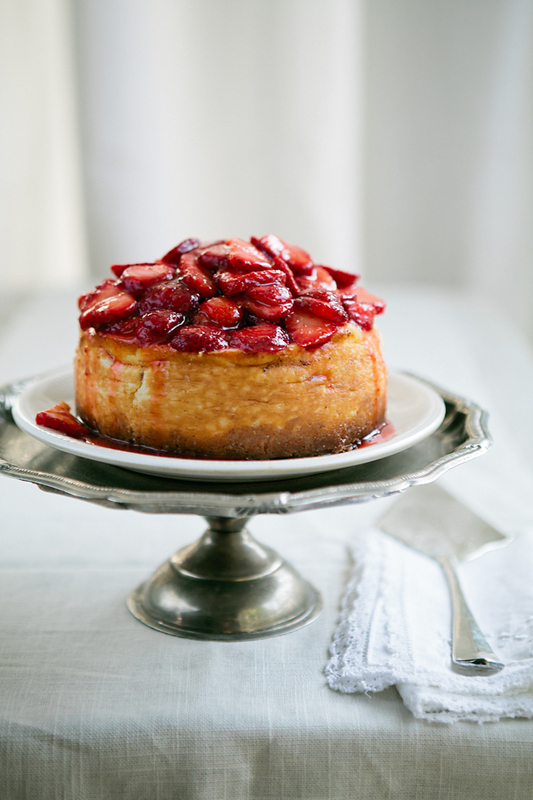 Your cheesecake is a stunner! And how much do I covet your cake stand?! I know, isn't it gorgeous? Since I've started blogging, I'm like an old lady, enjoying antique finds :)). I love cheesecake. Found your blog through food pics on Tumblr. I am looking forward to trying this recipe. Yum! I haven't even made my way to Tumblr yet... Thank you! Very nice explained recipe! Cheesecake looks wonderful on the photos.